Select time periods and reminders for follow-up flags using Ctrl+Shift+G, which opens the Set Custom Flag dialog box. This avoids having everything due tomorrow when simply clicking the flag. 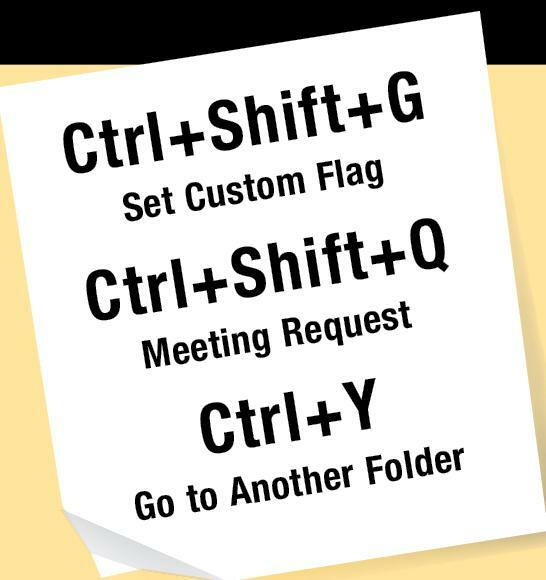 Create a meeting request without having your calendar open by selecting Ctrl+Shift+Q. Open a blank meeting request from wherever you are in Outlook. It will also leave you where you started. Go to another folder in Outlook by using Ctrl+Y. If you have a lot of folders in Outlook, you know that the Navigation pane doesn’t give you a lot of elbow room to scroll and expand. This shortcut saves you time and frustration by opening a dialog box that lets you pick the folder you want. Do you send similar replies to certain email messages?